This year has not been a tiptoe through the tulips. Thank you community. From the bottom of my heart, thank you for being a part of Effortlessly with Roxy. To say that 2018 has been a trying year, a growing year, would be an understatement. So much has taken place this year and tested my personal limits. I truly thought that 2016, when my Dad passed away, would be the worst of it. I figured that I would feel sad and grieve for a few months but that life would eventually come to a new normal. Instead, so many of the echoes of losing my Dad hit hard this year. It was 2018 that my sister and I realized that Mom could no longer handle the home we grew up in on her own. 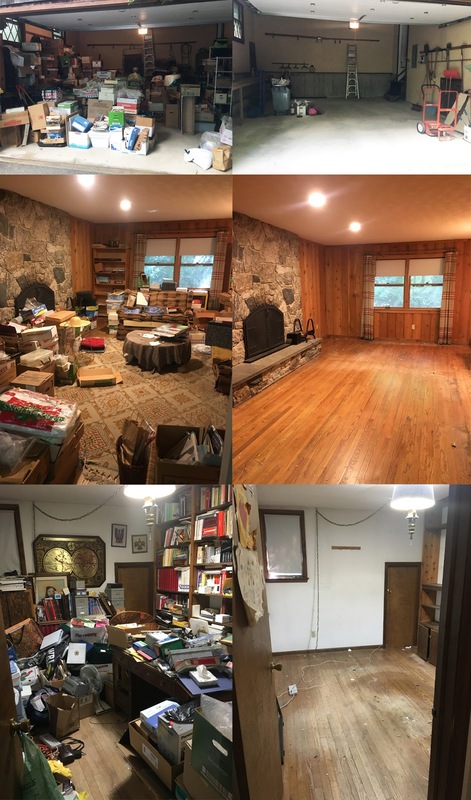 It was 2018 that we took on the huge undertaking of cleaning out a house Mom and Dad had lived in for 40 years, a house that had reached hoarding levels of messy. I could never have done what we did for Mom without this blog. Without you here supporting it. Thank you. It was this year that we realized that even in the best circumstances, Mom will likely need financial support for the rest of her life. 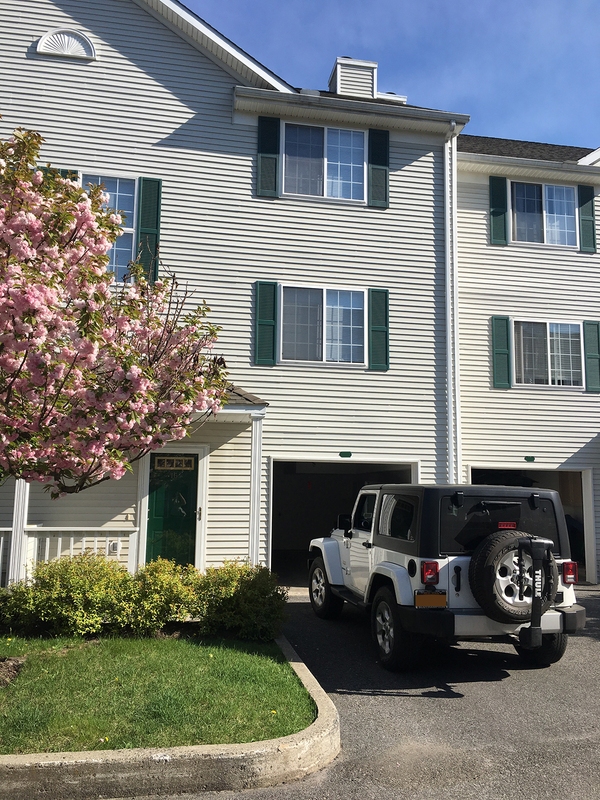 And it was this year where, thanks to the healthy side income that I earn from this blog, my sister and I were able to combine our savings to buy Mom a new condo, in town and near the services she needs, completely in cash. For the first time in over 40 years Mom is mortgage free. And I really, truly, cannot thank YOU enough for that! To be able to use blog earnings to buy Mom a home, wow, it’s such a cool thing! 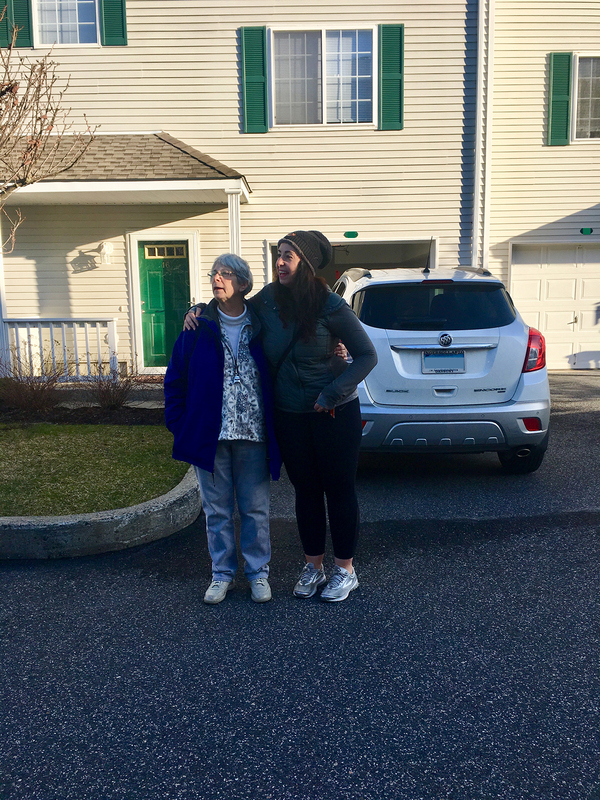 It’s a huge sigh of a relief and it is a blessing that allowed Mom to make the transition from a family home to an active senior’s condo slowly rather than via the rush of a home sale’s closing window. With Mom on move-in day. The beautiful cherry blossoms outside Mom’s condo around Mother’s Day. Of course, there are trade-offs in every decision. Investing in Mom at this time meant that Alex and I put aside our own home ownership goals for the time being. It also meant scaling back the breadth of our wedding, although in the end we haven’t had to sacrifice as much of the wedding as we feared we would. I humbly add that while I was always close with my Dad, my Mom and I do not always get along. It’s been a challenging relationship most of my life. Still, when the moment arrived and the Universe made a request of me, my sister and my fiancé to take care of Mom, it was never a question. We immediately said YES. It’s meant many stressful nights awake at 3 AM where I use every technique I’ve learned for healthy coping. To hope that I can make it til the next paycheck if Mom or I need something in an emergency. To wonder how much it would cost to clean out the house. (It cost a lot. A lot a lot. So much more than we budgeted. It was still worth it.) To hope that my savings, now greatly depleted, will regrow quickly for our future goals as a couple. To wonder how life is going to unfold over the next 10 years or so. A few before and afters around my childhood home — and this was after we’d spent 6 months pre-cleaning! Junk crews took the rest of this stuff, which was emotional to say the least. In the last 2 or 3 years I have done a lot of personal growing. This journey, I realize, will continue my whole life. I am not pretending like I have it all figured out — quite the opposite. In truth, I’m putting it out there that I don’t have it all figured out and that I am a student of life learning, making mistakes, and trying new techniques to get the most enjoyment out of life possible. In my 20s I spent a lot of time angry and I really didn’t understand why. Now, in my mid-30s, although I know I’ll always have that snap anger tendency on tap habitually, I am learning better ways to support myself, the people I love around me, and my own coping mechanisms. So another thank you. Thank you for supporting me when I needed a break. This is why I had to take such a long break from the blog and Instagram over the Summer. I realized that I was stretched way too thin and something was going to give. I saw a choice; I could either support myself and make sure I didn’t over-deplete, or I could keep going like a runaway train until I crash like I had in the past. I did an amazing shoot with Free People last Spring, which I never even got to share! Maybe I will even though some of these products are now sold out. Thank you for your emails, DMs, and texts asking after me while I was away. It wasn’t my intention to be gone for so long, but I also needed that time away to refresh. At 30 I quit my full-time job (Best. Summer. Ever.) and tried blogging full-time for awhile. That experiment didn’t work out. In fact it was a disaster! Not only did I lose my enjoyment of blogging as it felt ever more like a ‘job,’ I also found myself stressed out and worried every month about how I was doing, if I was making enough money, if someone else was stealing my ideas (not very healthy) and why I wasn’t doing as well as other influencers (super unhealthy). I have learned through trial and error that part-time blogging is best for me. I love the passion my day job gives me and I love the way it makes me excited for the creative outlet blogging and influencing were always meant to be for me. This year my career has advanced in very exciting ways! The better I do at my day job, the freer I feel to come here and simply be with you, community. To share what I’m excited about (or frustrated about) in the superficial, superfluous world of shopping. Where nothing matters except our wishlist, our shopping cart, and our closets. In 2018 especially, this blog has been a healthy escape for me. It’s been a place I can come when the world isn’t making sense and let the creativity flow. I am more grateful for that than I can put into words. (Tearing up as I write this.) I’m so glad I don’t have to be here alone. It’s very fun for me to have a group of people I can share this fun side hobby with. A side hobby that I am equally passionate about as my full-time endeavors. 2018 has had its highlights too. Now, 2018 hasn’t been all bad. Just a few days before the year started I got engaged to the most wonderful man. I’m very excited to share our wedding planning and engagement experience with you beginning in January 2019 when Wedding Wednesdays will kick off. From wedding dress shopping to venue picking to experiencing and observing some wild emotions and stresses, I’m ready to share it all with you! In the meantime, Alex and I are enjoying a long, relatively stress-free engagement. One of our favorite photos from our engagement session — more of these in January. Alex and I may not own the apartment we’ve been dreaming of yet. We may not have the Adventure Van we want to travel around the country in yet. I may not have that dream day job I’m reaching for quite yet. I might be stressed trying to wrap up the sale of the home I grew up in and making sure that Mom is taken care of daily by her aides. In some ways I am further along than I expected to be at this point in my life. In other ways, I feel behind. In still other ways I had never thought this far into life (does any 18 year old really think of being 36??). The year isn’t over yet certainly but this seems like the appropriate time to say it. Thank you community. I am so happy you’re here. New posts coming on Black Friday as well as over this super fun shopping weekend. Previous Post Shop the Madewell 2018 Black Friday promo and more early!! Dearest Roxy, thank you for the chance to be a part of your community! I've loved the chance to follow you and hear your wonderful insights and tips! We will always be there for you, through both tribulations and the wonderful joys to come! Thank you Sunshineshopper, this brings me to happy tears. The support of this community is incredible, and I am humbled by it. Thank you so much Roxy for always posting about so many great stories, wonderful sales and inspirational ideas all throughout the year! Also, I adore that first picture with your feet in the air hehe (so cute!) and have a very Happy Thanksgiving!! Roxy – so glad that you have stuck with the blog as it has been a fun ride through the years (even if most of us no longer check outanthro wish list 18 times a day lol). But most of all, you have made it though a tough year that may have undone even the toughest of us with grace. I wish you a fantastic year to come and look forward to all the fortunes it will bring you. Thank you so much Shari!! And you as well, Guest. Thank YOU for that incredible post. It takes a lot of courage to be so honest and it really resonates. You are doing awesome. You made an awesome choice to step away when you needed to. And I am so happy when you decide that it IS good for you to come back and share! You are a very precious spirit and dealing with our parents and all the wonderful / horrible / confusing / loving / stressful feelings that come with it is a job in itself. Thank you for honoring your mother; I am sure that in the long run, it will be a blessing in your life. Thank you so much for these kind words Susan. They've brought a smile to my face! I appreciate you Roxy and as I have said before — you have opened my eyes and helped me step out of that Anthro box. Thank you for your honesty and I wish you a very happy healthy coming year. Thank you so much Karen!! And I wish the same for you. WOW! You are doing good work and we are happy to support you! I appreciate that so so much gladmama! Thank you. Thank you, Roxy, for creating this welcoming space, where it's ok to share not just the fun things in life, but the difficulties as well. Having gone through a similar situation with my parents recently, I found it incredibly helpful to read this post. The before and after photos of your mom's house are incredibly encouraging. Did you hire some type of professional help you sift through all of the piles of stuff? My biggest concern is tossing out important papers by mistake. We ended up going through about 1/2 the stuff ourselves, mostly because Mom was understandably afraid that a professional organizer might throw out something important. In her own way Mom knew where everything was — even stuff that had been buried under piles for years. So my Sis and I went through as much as we had patience for with Mom, and her aide helped a TON. (Mom is nearly blind from diabetes now and her aide is seriously a Godsend. She can see well enough to do most everyday things for now.) We made sure all the super important stuff (records, taxes, etc) got out. After about 4 months of that, it became clear that if we didn't push the process along we might have to carry the house for another Winter, which would be very expensive. Additionally the condo is purposely smaller than the house so there's a limit to how much we wanted to let Mom bring over! We gave her one last month and then we called in junk crews to haul it all out. There wasn't enough of value to hold an estate sale and our house is quite secluded with a long, 4×4-requiring dirt driveway. So a tag sale would have been hard anyway. The junk crew we used, Stamford Junk Pros out of Stamford Connecticut is AMAZING. They were so understanding of the situation. I found them extremely courteous, professional and they did a fantastic job. We ended up sending over 10 DUMPSTER LOADS out of the house. In the end preparing the house for sale has cost about $15,000 that we weren't planning on spending. That's been a little tough for me and sis to absorb, but we're doing our best. Thank you so much, Roxy! This is really helpful information. I hope you have a nice Thanksgiving. This is a wonderful post – very honest and refreshing. I hope that the remainder of this year and next year bring you all the best! Thank you and have a wonderful Thanksgiving. Thank you Melodie! Happy Thanksgiving and same to you! You seem like you’d be such a cool person to know in real life. Thanks for all that you shared in this post! Ha thanks Nam yeah my Mom is really cute! My Sis is shorter like her and I'm very tall like my Dad. Thank you so much for honestly sharing everything that you've experienced this past year! I teared up reading about your Mom as I think many of us can relate at least emotionally to what you're been dealing with on that front. I so appreciate this blog. I've had a tough few months and being able to open up this page in the morning gives me at least a few moments of peace. Thanks for sharing and like I posted to you once before years ago–don't let anyone ever let you feel guilty or uncool for making money off this blog. You create a great product and work hard to maintain it, so you deserve whatever you receive. Happy Thanksgiving! Major hugs to you LaurenSophie!! Hugs to you and congratulations on surviving such a tough time! I really appreciate you being so open with us and sharing nuggets of your life from time to time. As someone who is a classic introvert, I can tell you that's it's more helpful than you know. My love affair with Anthropologie comes and goes but the humanistic aspect of this blog is what keeps me coming back. I'm thrilled that you were able to move your mom closer to you. I totally get the peace of mind it brings! You deserve all the success in the world and I'm wishing you peace, happiness and a wedding to remember going into this new year 🍾🍸🎉🙏. Happy Thanksgiving to you too Lindinha. And thank you!! Hello Roxy! I am so incredibly excited to think you may start posting regularly again. I have followed you for years. You have a one of a kind blog, full of unique perspective, treating readers to consumer insight and consumer business processes like no other blog out there. The fashion blog world has been sorely vacant a spot without your regular postings. Glad you are doing well and are back in the saddle. That's a great point Bronzi. We'll have to see what the future holds. In some ways my relationship with Mom has already gotten better, but it's still not great. There were things she learned about her parents relationship and in turn both her parents that made some things much clearer. She always said her Mother was a MOM not a Mommy. Her MOM is now a MOmmy. My friend is 42. That took time. Blessibfs to you both regardless! Happy Thanksgiving Roxy! Thank you for your openness – it is hard as our parents get older. I know my mother and I got much closer after my father passed away. It's wonderful that you have a good support system in your fiance and sister. I hope that your mom is enjoying her lovely new place! Love the pictures of you and the flowers. The one with your feet kicking up out of the tulips is silly and fun. Oh yeah that shoot was so much fun!! 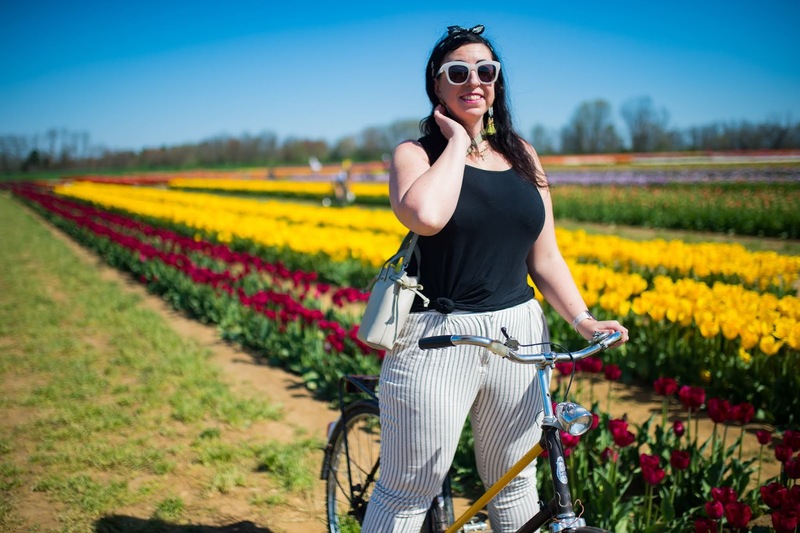 Just seeing rainbows of tulips everywhere before the trees had really leafed out was such a pick-me-up. Oh Roxy what a wonderful post. I've been a follower for years because you've always felt very approachable. I'm so happy you and your sister could do this for your Mom. I wish her many happy years in her new home! Roxy, many thanks for a great post that helps us remember all that we are thankful for. You have a great gift that allows you to write as if you were talking on the phone to me alone. You must be so sweet, savvy and sassy! I wish you all the best in 2019! You are beyond sweet Almisa! Thank you and I wish you the same. =) Thanks for being here. Thank you for sharing your highs and lows so authentically. My dad is also a hoarder and our relationship has been hard for most of my life. I appreciate the compassion you've been able to show your mom. Best wishes for a wonderful 2019. Sending you lots of virtual hugs! I know it is not easy. If I can share anything I've learned, it's not to judge myself for getting upset about the situation, and also not aiming for being that perfect daughter who can tolerate anything. I am not a 'better daughter' by stuffing down the feelings that come up sometimes. It's OK to not feel okay about it at all times. Perfection is not the goal. You just do the best you can each day, even if the best is arguing or feeling sad or whatever.